This time around there were 23 unique solutions (not counting incremental updates) submitted by 10 contestants. Many of them are returning addicts, like Ogre, kingofthespill, Bob, BFC, squint and Andrew. Others posted their first contest entries: BioDroid, Casius, Critters and RyanM all built extremely interesting and inventive solutions, and RyanM even bested many well-established 'Dillo Runners with a score of $2706! :arrow: Check out all the great contest solutions in this zip! There were 2 basic ways to solve this level: going over the top and along the bottom. The former presented the important challenge of getting the armadillo across the top as cheaply as possible. The best mechanisms to do that all used the force of the rubber in some way. In the end, using this method, going over the top was considerably cheaper than the alternative. Building the catcher was the second big challenge. Here, there were again two different routes to take. 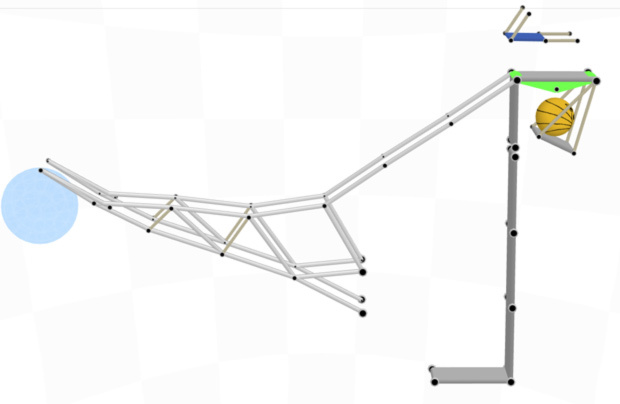 The obvious, using the bottom two anchor points to build up a tower, and the less obvious and harder to build - but much cheaper - option of creating a kind of suspension bridge from the right. The next in line were Bob with $2708 (and $2704 using a very different, fun hopping mechanism) and RyanM with $2706. The only other person to break $2700 was Ogre, but only with a little help from Master Yoda. Last edited by PeterT on Wed Jul 12, 2006 5:17 pm, edited 1 time in total. Ah, shoot. I actually tried building a sliding bridge briefly, but never got anything close to working. My over the top launcher was never that efficient either. Nice work! Can't wait to check out the rest later, at work right now, no game to load solutions into. I think I ended up pretty much dead last in this one. I haven't had anywhere near as much time lately to spend on AR, but that's no excuse, I got totally owned. I can't wait to see these solutions. I'm not currently at my PC so I will have to review them later. I really liked this level and feel I got a bit lucky with my over the top approach pretty early and just stuck to developing that as best I could. My original lifter/reverser at the start was quite huge and it trimmed down all the way to what you see in the picture. It amazed me it ended up being so small and cheap. I already have the next level prepared as I like to create levels anyway. This level is hopefully unique (so far) and involves path ways that have set amounts of time before they become un available for use. That is, a trap door shuts after so many seconds pass after hitting start. Looking forward to seeing these solutions later!! Once again you showed us how it should be done. It's nice to see so many different, fascinating solutions and some new competitors. These solutions are over my head! BFC you are a freaking genius. That armadillo swing is perfect. I feel the same, can get quite close to the top one if I had not done that. Wow, all of these solutions blow my mind, I think all of the solutions using the dark force, and metal bar slides were awsome! And also kingofthespill's push and pull, at the begginging where the metal sheet breaks off and makes a bridge for the other side was cool. . great job everyone, you guys are geniuses. Interesting. The top solutions rely on using exploits, but they are within the rules. I didnt have to the time to come up with anything this round, hopefully I can get something going next time. Well, you can modify my solution just a tad and come up with a 2736 solution that doesn't use welding to hold at the end. Since welding is within the rules here I chose to use it. Last time I chose not to use it was on the rubber / elastic only level and it cost some precious $$ there. Even at 2736 my solution still comes in on top at least I wouldn't say this solution relied on the welding exploit, it certainly help boost the score however. Click this stupidly long link to see the modified level. I think the force should be legitimate. Its something everyone can do and doesent require 3rd party software. I think the force is going to be removed from the game in updates but welding will still work, provided all nodes are created completely outside other objects. Many of them are returning addicts, like Ogre, kingofthespill, Bob, BFC, squint and Andrew. Maybe there should be contest junky medal . I reckon the game would be better if welding was removed too, from an asthetic point of view - it just doesn't make sense!